Stephen Boyd and Mariella di Sarzana married each other on August 30th of 1958 in London during the filming of Ben-Hur. Mariella was an Italian studio agent assigned to ‘take care’ of Stephen during his time in Rome, which she clearly did! Above, Getty Photos of Stephen Boyd and Mariella di Sarzana in London in August of 1958, getting married. The pair had actually flown to London to tie the knot and returned shortly thereafter to Rome. 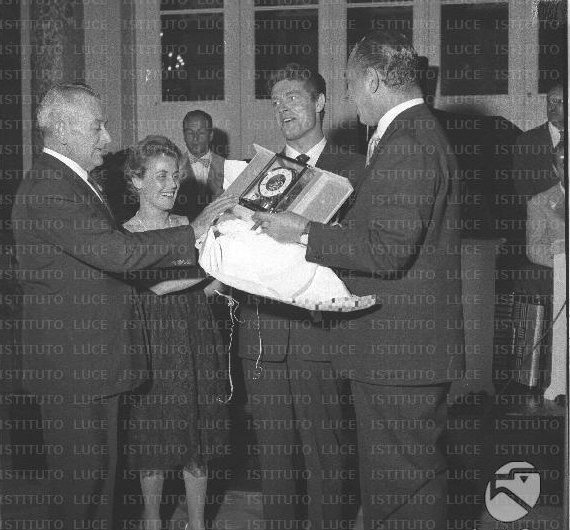 The photos below of the reception can be seen on a great website for rare Italian movie photos and information- http://www.archivioluce.com. “Yet Stephen Boyd, who enjoyed to the hilt playing this villain, was so popular with members of the film’s Italian-British-American crew in Rome that, when his assignment was completed, they presented him with a gold clock emblematic of their affection. ” (http://www.blu-ray.com/news/?id=7408). The clock being presented to Boyd in the photo above. Other members of the Ben-Hur cast, including Charlton Heston, Cathy O’Donnell and director William Wyler can be seen enjoying the festivities. Sadly, Stephen’s hasty marriage began to fall apart a few weeks after it started. “Filming kept us apart for long period and when we were together we were never alone. Every night when I came home a whole army of her relatives were camping in our apartment. I soon realized my love for Maria was an infatuation. I knew the marriage wouldn’t work–so it was ridiculous to keep up any pretenses. Less than a month after their marriage, Boyd and Mariella separated. Their divorce became official on March 20, 1959, after Mariella briefly visited Stephen in Hollywood. Before the marriage fell apart, however, Boyd and Di Sarzana can be seen dancing the night away at their Rome wedding reception in 1958 – looking overjoyed and madly in love.